There are few things that strike more fear into my heart than EU VAT, apart from perhaps spiders. In the age of the internet as it becomes increasingly easy to buy and sell abroad, so EU transactions are becoming a more common feature in the small business VAT returns. EU VAT cannot be avoided, (a bit like spiders) so it’s best to make peace with it and learn to understand it. But this is easier said than done, as I’ve found researching this article. The idea of the EU VAT rules are so that small businesses can trade within the EU area without having to register for VAT in every single EU country. Although the rules are complicated, the alternative would be a lot more work and bureaucracy. VAT is a consumption tax. As a VAT registered business you pay VAT when you buy an item and then reclaim the VAT back by including that item in your purchases total on the VAT return. VAT registered business trading with each other are able to pass the VAT down the line. It is the poor consumer at the end of the line who ends up with all the VAT and nowhere to reclaim it. It is a consumption tax because the consumer ultimately pays the VAT. 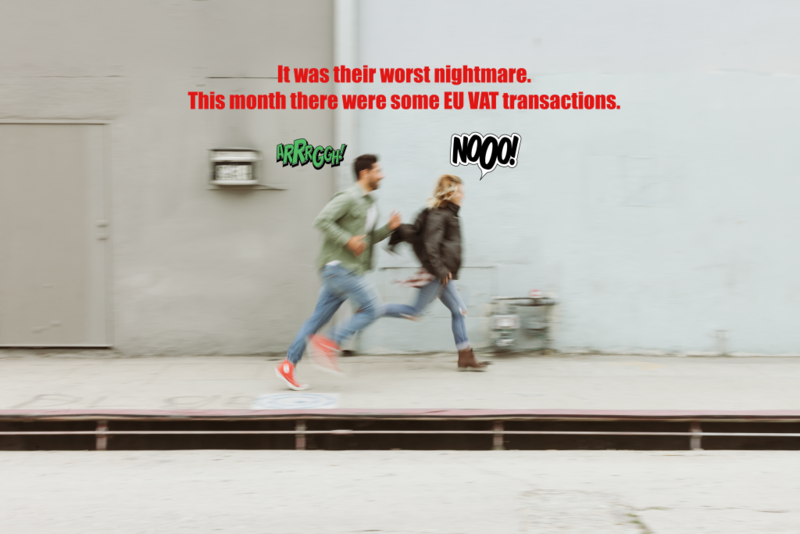 EU VAT aims to achieve the same effect, so that VAT registered businesses trading with each other inside the EU are able to pass on the VAT charge down the line to the ultimate consumer without having to deal with complex bureaucracy in each country. There are a couple of important distinctions that we need to bear in mind before we get into any details. A very important distinction for EU VAT is whether someone is a consumer or or whether they are business. For VAT purposes, this normally depends on whether they are VAT registered or not. Generally VAT number equals business and no VAT number equals consumer. Under this logic, a business that is not VAT registered will count as a consumer. If you are buying and selling solely within the UK then goods and services are treated in a similar way on the VAT return. Once you trade outside the UK, it becomes important whether something is goods (a physical object that is moved from place to place) or a service. This is because a sale falls within scope of the VAT rules based on it’s place of supply. Goods are quite straightforward. Goods supplied from the UK to other countries are in scope of the UK VAT rules, goods supplied from France to other countries are within scope of the French VAT rules and so on. Goods fall under the VAT rules where the seller is based. The service rules assume that if you are going to provide a service e.g. consulting, training, then you will go and deliver it in person. The service place of supply is where the customer is based (the opposite to goods). A UK company provides training to a French company. The customer is based in France so the place of supply is France. The sale therefore outside scope of UK VAT. Services fall under the VAT rules where the customer is based. The poor non VAT registered consumer bears the final cost of the VAT whether in UK or EU. To all intents and purposes (and in most bookkeeping systems), you treat this like a sale to a UK customer. You just add your 20% UK VAT to the net amount as normal. This is fine if you have only a small element of your sales outside the UK. However, if you start to make large volumes of these type of sales (known as distance sales) or have high value distance sales, you may have to register for VAT in the EU country and start to charge the relevant VAT. Different thresholds apply for each country. If the value of your EU sales is over £250,000 per year then you need to complete an Intrastat Supplementary Declaration. There are also different rules and processes for sale of digital services to consumers (non-VAT registered customers) in the EU. In that case the VAT must be charged at the local country rate and returns submitted using VAT MOSS. See VAT MOSS post for further details . To be considered as a business sale, you must have the customer’s VAT number. If not then it gets treated as a consumer sale. Both your VAT number and the customer VAT number should be included on the sales invoice. Any sales to EU business must also be included on an EC Sales list. This is a separate return at monthly or quarterly intervals which may not run to the same schedule as your VAT returns. Many accountancy packages can produce this automatically for you to submit. If you are selling goods to a VAT registered business in the EU, then you can zero rate (0%) the goods for VAT, that is you charge the net value without adding any VAT on top. Most bookkeeping systems should have a specific VAT category for this. For the sale of goods the place of supply is the UK, so the sale is in scope of UK VAT, but the VAT rate is 0%. This sale also needs to go on your EC sales list. If you are supplying services to an EU country then the customer is responsible for charging the VAT (see reverse charge section below for more details). For a service the place of supply is with the customer so it is outside scope of UK VAT. You zero rate (0%) the goods for VAT, that is you charge the net value without adding any VAT. Services to EU do still need to go on the EC Sales list; hopefully your bookkeeping software will have a VAT category that will allow you to do this. What about flat rate VAT? If you are in the flat rate scheme then to all intents and purposes you don’t have any input VAT (VAT on your purchases). Your VAT obligation is calculated as a percentage of your gross sales turnover for the period. You work out your gross sales by including the 20% VAT element and then the VAT you owe is a percentage of that total e.g. 14.5% for an IT consultant. This percentage is meant to cover an element for VAT on purchases, but without having to work through all the individual transactions. If you are selling goods or services to an EU VAT registered business then you normally zero rate the sale so no VAT would be included. But how does this fit with your flat rate turnover calculation? Buying goods or services from EU – VAT is calculated on sales turnover so it makes no difference whether purchases are from the EU or not or whether they have VAT or not. What about if you are buying goods or services from the EU? Well effectively the same set of rules apply but in reverse. If you import more than £260,000 of goods from the EU per year, then you will need to fill out an Intratat Supplementary Declaration. If you do not supply your VAT number to the seller, then you count as a consumer. As on the sales side, VAT is included at the seller’s rate forming part of the price that you pay. As a consumer, you bear the final cost of the VAT without being able to pass it on. You treat the item as if it had been purchased in the UK with no VAT. To be considered as a business transaction, you must supply your VAT number to the seller and they must be VAT registered in their country. VAT on purchase of EU goods is charged as if you had bought the goods in the UK from a UK supplier. This means it is charged at the UK rate of 20% in sterling. HMRC publishes an exchange rate if you need to make a calculation, or you can use the published daily rate. You might think this is strange, that you are getting to claim 20% VAT when the seller has to charge 0%. That doesn’t seem fair. But just wait and see. The 20% VAT also goes into Box 2 on the VAT return for EC acquisitions. Box 2 contributes toward the sales (input VAT total). Overall the net effect is zero VAT as the VAT on the purchases side of the calculation is cancelled out by the same VAT amount on the sales side. So in the end, after all those complications, it is fair because you come out the same as the seller with zero VAT impact overall from the transaction. Again this is the opposite situation to the sale of EU services (above) If you are buying services from the EU then the place of supply for the services is where you are based as the customer. No matter which EU country the service is supplied from, it falls under UK VAT and you are responsible for charging and accounting for the VAT, not the supplier. This is done using the reverse charge. The reverse charge sounds quite complex because the transaction is treated in the VAT return as if it were both a sale and a purchase. It is as if you were selling the service to yourself. You include the item in the purchases total and the VAT on purchases total as usual, but you also include it in the sales total and the VAT on sales total as well. Overall the net effect will be zero VAT, unless you can’t include all of your purchases e.g. you are partially exempt. The supplier should have provided on invoice without any VAT. You enter the net amount that you paid then add 20% VAT on top. This VAT amount is included in the output (sales) total and in the input (purchases) total so overall there is no effect on the VAT due. This article is aimed at small businesses with relatively few EU transactions. If you are setting up any kind of regular EU trade, are planning large volumes or have more complicated circumstances you should definitely get specialist advice. Sale to EU non VAT registered – treat as UK sale. Add 20% VAT. Not on EC Sales list. Sale of goods to EU VAT registered – 0% VAT. EC sales section on VAT return. Include on EC Sales list. Sale of Services to EU VAT registered – 0% VAT. Not on EC sales section. Include on EC Sales list. Purchase of Goods from EU VAT registered – Add 20% VAT. Included in EC acquisitions sections on VAT return. Purchase of Services from EU VAT registered – Reverse charge, include in sales and purchases. Not included on EC acquisitions sections.